I had been eyeing spinach dips for a while, and finally had a good excuse to whip up a batch on mother’s day. Artichokes can only add deliciousness to food, so when I came across this recipe in Julie van Rosendaal’s Grazing, I knew I had to give it a try. The resulting dip was flavourful and smooth, perfect served warm over crackers. 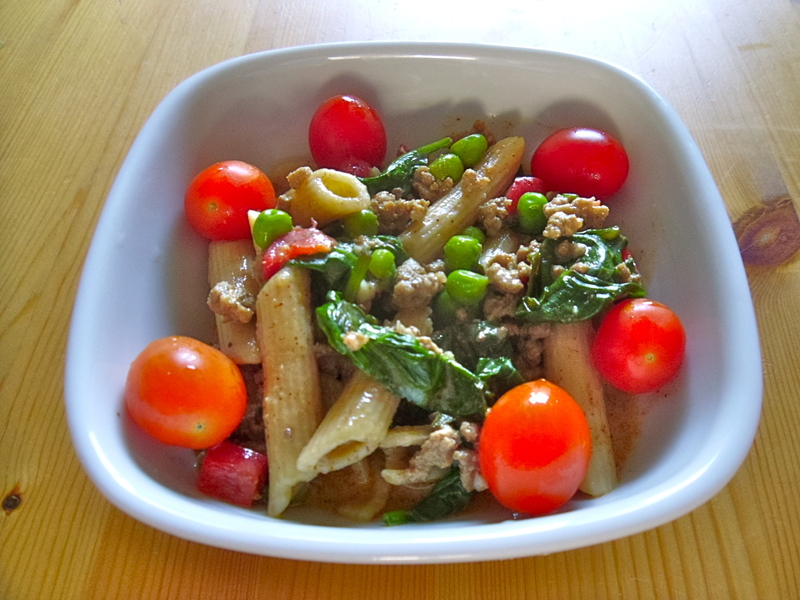 It also made for delicious leftovers the next day, which only seem to have intensified the flavours. If I were to do it again, I might use cheddar on top and sprinkle it on top just for the last 10 minutes – it would be just a little sharper in flavour and softer in texture for the top. But overall, a winning dip. Preheat the oven to 350 degrees. Saute the onions and garlic in about 2 tablespoons of the artichoke heart liquid until translucent. Add the spinach and saute until all the liquid has evaporated. Reduce the heat to low and stir in the artichokes, cream cheese and milk. Cook, stirring constantly, until the cheese melts. Stir in the sour cream, Parmesan cheese, salt and pepper and cook until heated through. Transfer the spinach mixture to a baking dish. Sprinkle the mozzarella on top. Bake for about 30 minutes, until golden and bubbly. Delicious serve with crackers, tortilla chips, or vegetables! To celebrate the year’s end, my health policy seminar held a movie night Friday. We watched a classic Quebecois film, La grade seduction (or, Seducing Dr. Lewis). Filled with quirky Canadian humour, it is a film that melts your heart. You cannot help but to be charmed by the villagers in Marie-la-Mauderne, and yet it also has real substance, a commentary on the plight of rural Canada’s attempt to lure and retain doctors under often difficult circumstances. For an appetizer, I brought spanakopita. I’ve been craving these ever since I went to Niche lounge for dinner in Halifax last month and had their trio of phyllos appetizer. On offer was the trio of olive & feta, creamy artichoke, and sun-dried tomato & spinach. The phyllos were melt-in-your mouth crispy and bursting with flavour. Three, however, merely whet my appetite. 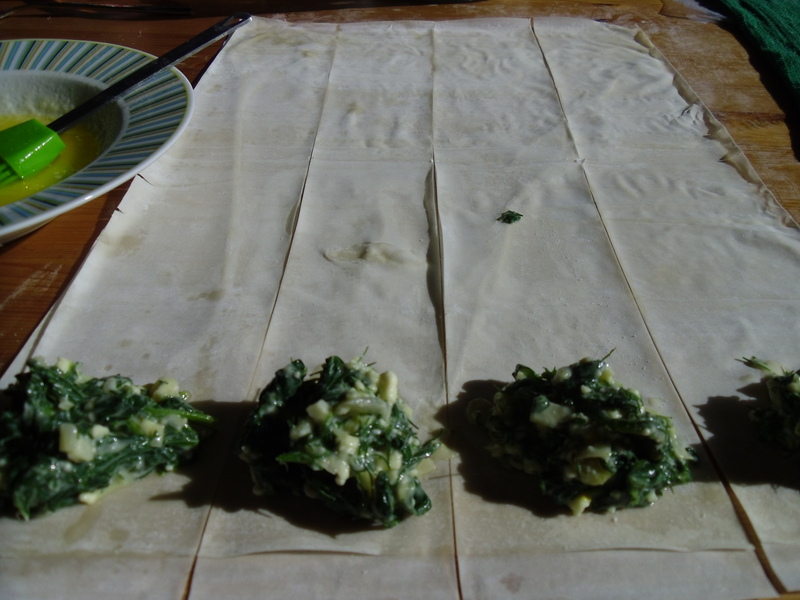 And so I found myself making the more classic spanakopita Friday afternoon. I love the creamy spinach filling wrapped in layers of crispy phyllo. I always add extra dill, which complements the spinach so perfectly. 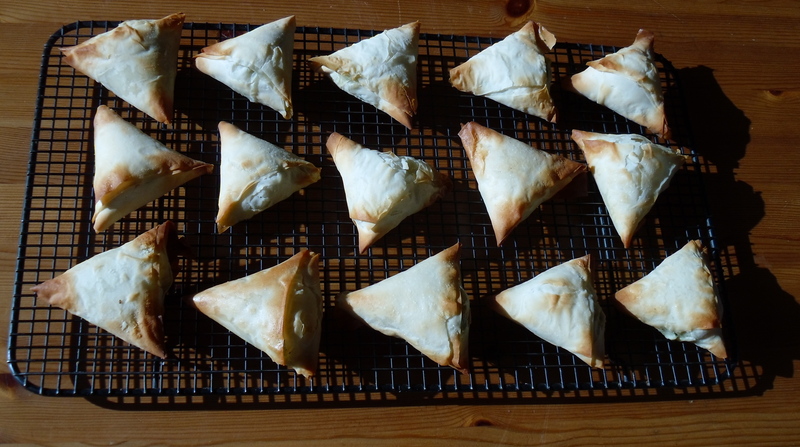 I remember making these for the first time years ago, scared to work with phyllo pastry. 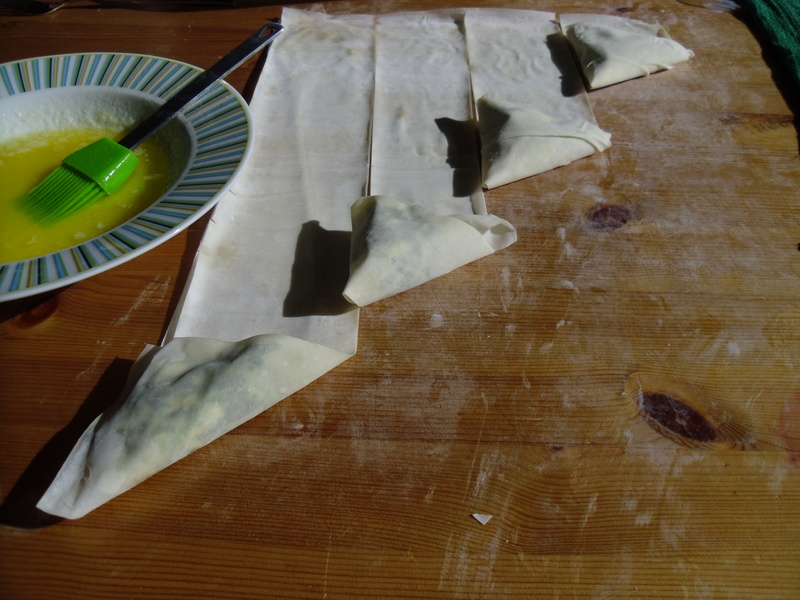 But it is surprisingly easy, the trick being to keep the pastry moist at all times and not to be afraid of a making a few imperfections (or having your first attempts look more blob-like than triangle shaped pastries!). And once you’ve mastered the phyllo, the sky is the limit on fillings: shrimp and ricotta to curried chicken to apples and cinnamon! A moist towel is key for keeping the phyllo moist! Saute the onions and garlic in the olive oil until translucent. Wilt the spinach until cooked through. Allow to cook for a few minutes. Crumble feta in a bowl. Beat in egg and dill. Stir in the spinach mixture, and season with salt and pepper. Phyllo strips cut and ready to roll into triangles! Preheat the oven to 400 F. On a clean counter, spread the phyllo pastry and cover with a moist towel. Lay a sheet of phyllo on the counter (making sure to keep any extra pastry covered), and brush it with butter. Cover with a second sheet of phyllo. 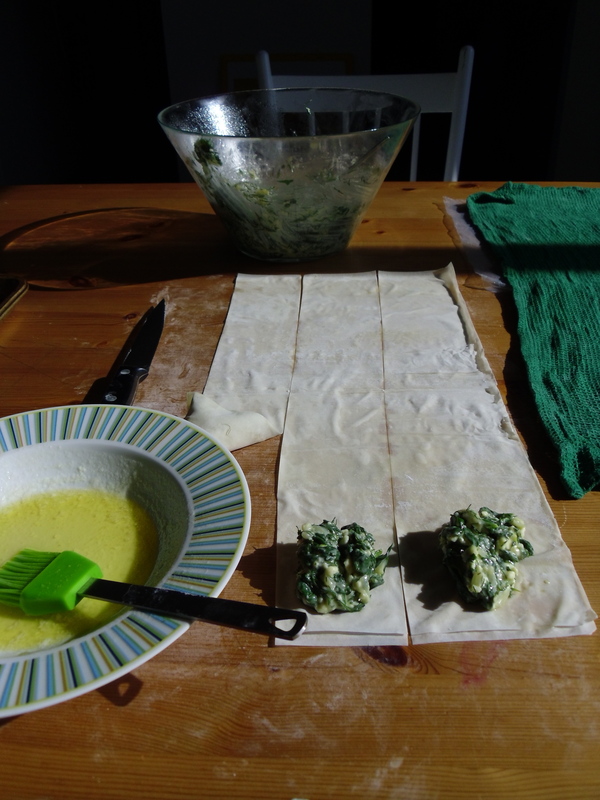 Using a sharp knife, cut the phyllo into four long strips. Place a spoonful of the spinach mixture near the bottom of each strip. Fold the corner over, continuing to fold on the diagonal, resulting in a triangle. Place the completed pastry on a baking sheet, and brush with the top with butter. Bake for 15 to 20 minutes, or until golden. These won’t last long, so best to eat them warm out of the oven! Cream of broccoli and spinach soup is the inspiration of children’s nightmares. Even in most cafeterias, you tend to end up with more cream than vegetables, thickened excessively with flour and way too salty. Flipping through rebar, I came across this recipe and was immediately dubious. Who is crazy enough to venture into making cream of broccoli and spinach soup? Deciding that rebar is an excellent cookbook, against my better instinct, I decided to attempt the soup. May I pronounce that this soup has remedied all reserve I had about cream of broccoli and spinach soup? Light and packed with flavour, it was truly hard to put my spoon down. The trick is to not overcook the vegetables and to be light-handed on the cream: I substituted milk, and it was just perfect. On its own, this soup is tasty; adding a swirl of pesto (a rebar recommendation) brought the soup to a whole new level of deliciousness! In a large saucepan, sauté oil, onion, garlic, and thyme until onions are transluscent. Stir in salt, chile flakes, potato, and broccoli and cook until tender. Add stock to vegetables and bring to a boil; allow to simmer, partially covered until the broccoli and potatoes are tenders, about 15 minutes. Remove from heat and stir in spinach. Once the spinach is wilted, puree the soup until smooth. Reheat the puree, add the milk, and season to taste with salt and pepper. Delicious on its own, or swirl in a few teaspoons of almond-Romano parsley pesto.